Short on time? This easy crockpot chicken recipe is one of the simplest recipes you’ll ever make! Plus it’s also delicious, filling and inexpensive. No wonder it’s a favorite! 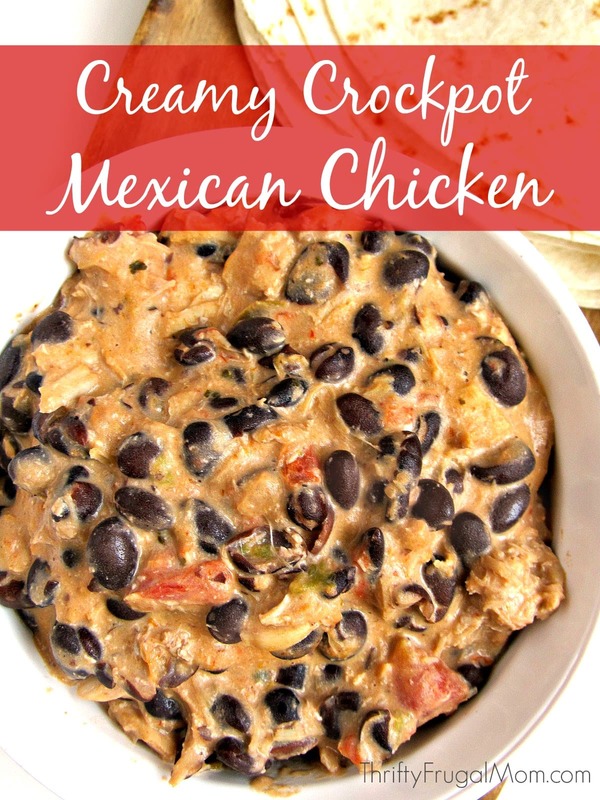 This Creamy Crockpot Mexican Chicken is one of my absolute favorite recipes ever! It’s probably the easiest recipe I make, it tastes amazing, and it makes enough that we usually can enjoy it for a second meal too. The only bad thing I can think of is that it isn’t exactly the most beautiful dish you’ve ever seen. But hey, you can’t have everything! We usually eat this Mexican Chicken in tortillas and if I do that, I often will stir some cooked rice into it just to give it more substance and stretch it a bit further. But we also have eaten it over rice and a couple of times when I was out of tortillas, we put it on top of toast. You could also treat it like taco meat and eat it with corn chips and lettuce. Really, I don’t think you’ll be disappointed any way that you try it. It’s a favorite here, even with our children who are slowly becoming somewhat picky eaters! 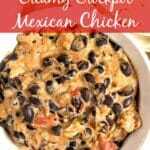 Put chicken, black beans, salsa and corn into crockpot and place cream cheese on top. Cover. Cook on high for 2 ½ to 3 hours. If this seems like it is going to be really soupy, you can leave the lid off for the last ½ hour to help thicken it. Torturing myself by looking at this delicious dish, as I can't eat any of it (on an elimination diet for my newborn). Thanks for sharing though! I found you through Thrifty Thursday. I don't care if it looks pretty or not. Quick, easy and yummy is all I am looking for. Pinned this to my "chicken" board. Look forward to exploring your blog, Lydia! This is finds be on the menu for next week!!! It looks delicious!!! I hope you enjoy it, Bijee! Thank you for sharing, I;m definitely going to try it for my family! Not sure what's Mexican about it though, it's more Southwest or Tex-Mex! This looks like a perfect summer dinner. My kids would love it! Thanks for sharing on Waste Not Want Not Wednesday! 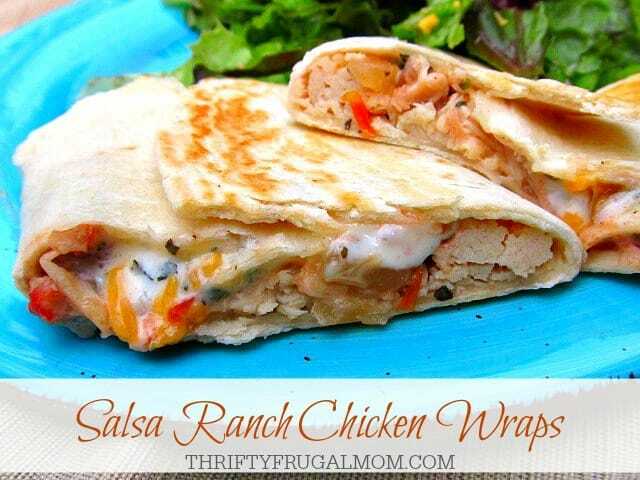 It's a winner all around- frugal, easy to make and delicious! made this today, but for time reasons just cooked on low for 7 hrs. one of the easiest recipes I've made and pretty tasty! Next time I will try adding some cumin and chili powder, may be a jalapeño for extra kick. I used a mix of chix breasts and thighs and I think pinto beans would work great in this as well. Plan on eating this as burritos wrapped in the awesome partially made tortillas from Costco! I am planning on making this tomorrow. What would be the perfect timing to do this on low during the day? Is 7 hours, per comment, just right? Thanks. Maureen, I've never done it that way, so I can't say for sure. But according to the comment Natalya left, it apparently worked perfectly for her. Hope you enjoy it! Heather, no, the chicken should be raw. Makes it so super simple! add the chicken into crockpot raw? Miranda, yes! If it's frozen, just make sure it is totally thawed. It couldn't be easier, right? Even if it's frozen, it's fine, just adjust cooking time. Suggestion on something I could use to replace the salsa? We have an onion allergy in the family. You could probably use Rotel or even just canned diced tomatoes. But if you do that, it's going to be a lot more bland, so then you'll probably want to add some more seasonings. I would probably just make it without any extra seasoning and then season to taste before you serve it. Hope that helps! I would think if you were just using canned tomatoes that maybe a packet of taco seasoning might be a great way to add flavour? I'm sure that would work great, Stephanie! Had me at black beans and cream cheese. I would use brown rice or a mixture of the rice and quinoa. I definitely be making this soon. Glad I found this recipe!!,??? You pretty much can't go wrong when there is cream cheese involved, can you? :) And quinoa would work great for this, Carolyn! I hope you love the recipe as much as we have. Trying this tonight! My husband and children are looking forward to dinner! I've opted to cook rice separate and add into bowls as serving. It's in the crockpot as I type :) Thanks for posting this very easy recipe! It took a total of 10 minutes to gather and dump ingredients into the crockpot! You are very welcome, Corrie! I love when dinner is this easy. :) Hope you all enjoyed it as much as we do! Anyone have the nutritional info? Jodee, if you want the nutritional info of a recipe, there are lots of free online tools that you can use to easily get that for you. One that I like to use is this one. Simply copy and paste the ingredients of this recipe (or any recipe) into the "Ingredients" spot and then click "Analyze Recipe" and you should have the info you need. Just wanted to say thank you for the recipe, it was really good. I added some jalapeños and used my favorite salsa, it was really great with queso fresco and pickled onions. I'm thinking it would also make a good enchilada filling - next time I'll make a double batch! Ah, I like the idea of using it as an enchilada filling! That would be yummy! Do you think I could cut this recipe in half and it would work the same? Absolutely! Should work fine and be just as delicious. This may seem like a silly question, but how many frozen chicken breast should I thaw for this recipe? I can't weigh it since they're frozen. Thanks in advance! No, that's not really a silly question, Jessica, but I'm not entirely sure because it varies so much on the size of the breast or thigh. But I would say roughly 2 to 3 pieces. If you have a tiny bit more or less, it's not going to make a huge difference. Hope that helps! That helps a lot, thank you so much for your quick reply! I made this for dinner tonight. AMAZING!!!! Is this with frozen chicken and if not should I double the time? The recipe is for thawed chicken. If you are using frozen, I'm not sure what to tell you as far as the cooking time since I've never done that. Enjoy! When do you add the beans in? I assume with the chicken at the beginning but it doesn't say. Oh dear...thanks for letting me know that! Yes, you add them with the other ingredients. I recently switched the recipe over to this printable recipe card and edited the instruction a bit to make it more clear and in the process must have missed that key detail. I appreciate you letting me know! Do you think using fat free cream cheese would work for this recipe? It's all I have and I'm trying to avoid a trip to the store for a single item! It should work just fine! I have often used the Neufchâtel cheese, which is basically lower fat cream cheese, and it's just as delicious as ever. Yum yum yum!!!! Thank you for this super easy and incredibly delicious recipe. I've made this and LOVE IT! Soooooo good. I REALLY wanted make it tonight and just realized i dont have black beans, I wonder if anyone has tried refried black beans or if it would work or be good w refried instead..or what i could substitute for black beans. I opted against refried this time, maybe next time! Do you think the black beans would cook enough if I throw them in the last hour. My hubby is bringing some home for now and I want to add them the last hour. What do you think? It makes quite a bit. When I serve it as a tortilla filling I'd say it serves at least 10 people. If you are going to eat it over rice, it would probably serve more. Thank you for sharing! How many does this serve? It makes quite a bit, Jenni. When I serve it as a tortilla filling I'd say it serves at least 10 people. If you are going to eat it over rice, it would probably serve more.